Sometimes I think of myself more as a kitchen curator than inventor. I scour recipe books and web sites and probe the creative and scientific minds of friends to arrive at the quintessential approach to a kitchen task. Last night the subject of my research was pumpkin seeds. I’d roasted a sugar pie pumpkin for a recipe to try out the whole grain sorghum provided by Bob’s Red Mill as part of their new Grains of Discovery line. I intended to make this Sorghum Salad with Curry-Roasted Winter Squash and Crispy Chickpeas developed by Garrett McCord for the International Food Blogger’s Conference we both attended last month in Seattle. Let me take this opportunity for an FTC compliancy shout-out that (a) I received a discounted rate at the conference in exchange for mentioning the conference and/or its sponsors in three blog posts (this is #2 if you’re counting, folks) and (b) I received a complimentary bag of the whole grain sorghum at the conference. 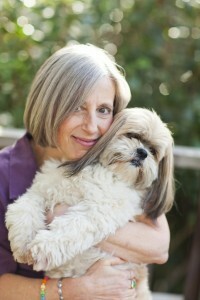 Please see the About Jennie Schacht page for additional disclosure information. I didn’t exactly mimic Garrett’s richly flavored and textured recipe, which was a personal favorite at the conference event where he and the folks from Bob’s Red Mill presented it. 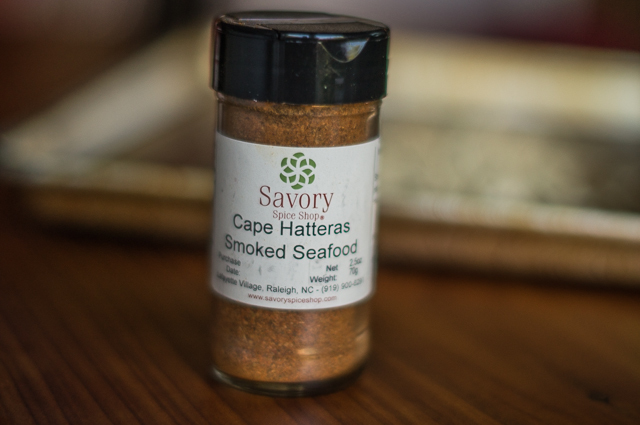 But the recipe did inspire me to roast up some sugar pie pumpkin with the Cape Hatteras Smoked Seafood Seasoning my new-found second cousin, Jill Warren Lucas of Eating my Words, kindly brought me as a gift from her home in Raleigh, NC. I’m lovin’ that stuff! While the pumpkin roasted, I boiled a cup of the sorghum in salted water until tender (as easy as cooking most any grain) and sautéed some padron peppers and a bunch of Russian kale. After draining the sorghum, I tossed everything together, adding a handful of chopped parsley, a few shakes of Aleppo pepper, a glugette of the supremely flavorful Séka Hills olive oil (Oh no! This was a freebie, too, from my pal Roberta Klugman, a talented public relations professional and California olive oil expert), and a drizzle each of Champagne vinegar and pomegranate molasses. Topped with a couple of chopped fresh Mission figs and sweet-spicy pecans, it made a satisfying dinner with a little something different in every bite. But what to do with the pumpkin seeds? 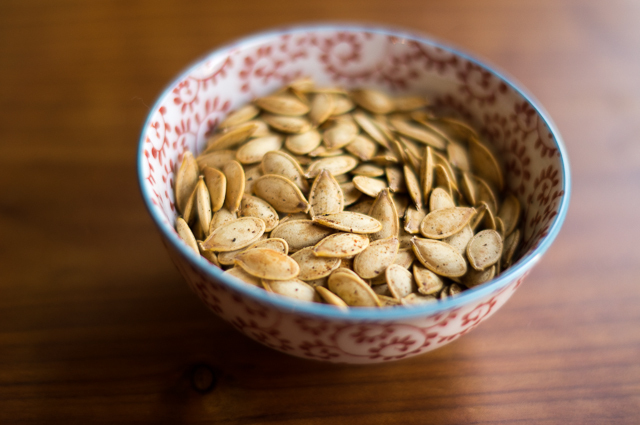 If you’ve tried roasting these mega-nutrient-rich tidbits that come along for the ride with your pumpkin, you probably know that the outer shells can turn out so tough that you end up chewing them forever before surreptitiously expelling them into a napkin. Still, I hate to waste good food and I knew there must be a better way. I diligently rubbed the sloppy seeds extracted from the squash’s cavity between my palms in a large bowl of cool water to remove the pumpkin goo, then rinsed them in a colander and laid them out on a clean dish towel until completely dry before discovering in my subsequent online research that some of these practices are debatable (removing the pumpkin goo) and the rest (laying out to dry) most likely entirely unnecessary. 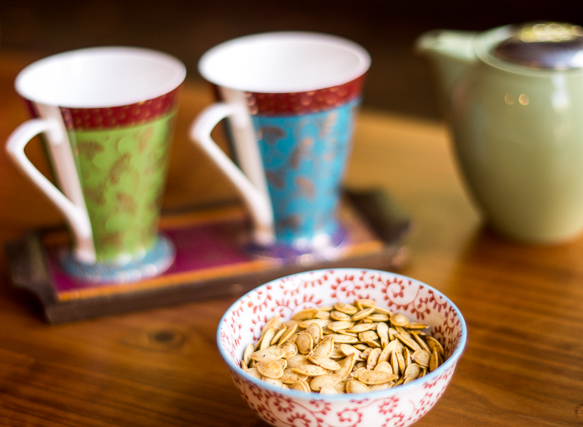 In the morning, I drizzled the seeds with olive oil, rubbing them between my palms to lightly and evenly coat them. My plan was to toss them with gray salt (I like the texture and like to believe I can taste something mineral-y in there), smoked sweet paprika, and a tiny pinch of ground dried Calabrian chile (hot stuff!). But then I remembered that Cape Hatteras spice blend, which incorporates most of those taste-awakeners and more: Mayan Salt, brown mustard seed, dill seed, allspice, Tellicherry peppercorns, coriander, celery seed, mace, cardamom, clove, ginger, bay leaves, and red japone chiles, all smoked over hickory wood, then blended with smoked Spanish sweet paprika for good measure. 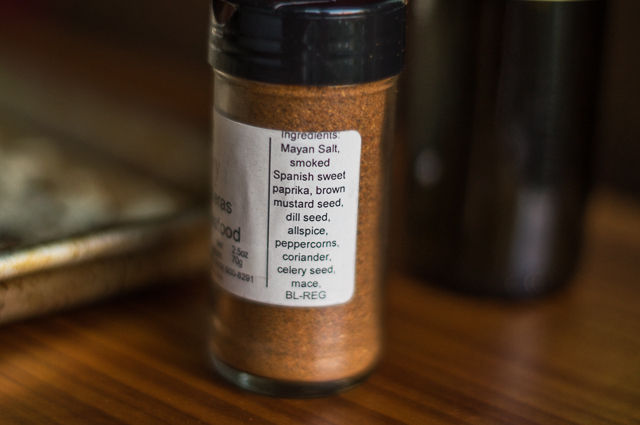 Be generous with the spice; the flavor gets muted in roasting and some ends up on the baking sheet. I baked the seeds at 300oF convection, shaking the pan now and then, until they were light brown and crispy. It took about 40 minutes. (Check them frequently near the end; there were reports online of the seeds going quickly from beautifully burnished to burnt.) It’s hard to resist temptation, but they’re best if you let them cool completely before eating. 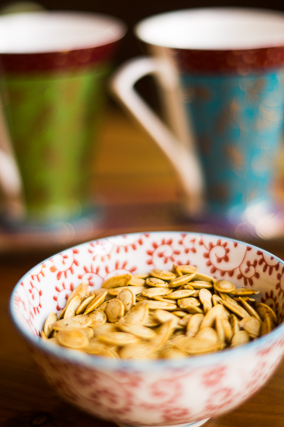 These toasted pumpkin seeds are crisp, nutty, spicy, addictive. Infinitely more successful than previous attempts, but not yet perfect. The outer shells are still a scoch chewier than I had anticipated from the accounts in the reference materials I used. Which leads me to ponder: Is there something after all to roasting them immediately after boiling? Perhaps they first steam in the oven, softening the shells, before drying out to crispy perfection? Or am I asking too much? This is the upside-downside of the librarian approach to a simple kitchen task. It leaves a new question to be resolved with the next pumpkin. 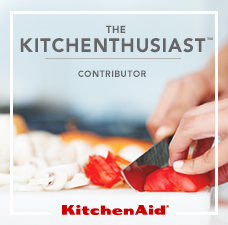 What’s happening in your autumn kitchen? 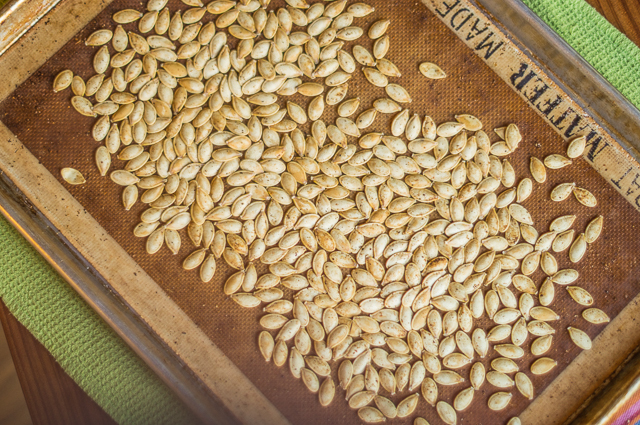 The seeds of Sugar Pie pumpkins are said to roast to a lighter, crispier texture than those of regular pumpkins. The pumpkins themselves are more tender texture and more robust flavor. Preheat the oven to 375F with a rack in the middle. Line a baking sheet with a silicone baking mat or parchment paper. Transfer the seeds to a pot and add water to generously cover, about 3 cups. Add a tablespoon of salt. Bring to a boil; reduce to a lively simmer and cook for 10 minutes longer. Drain the seeds in a colander. 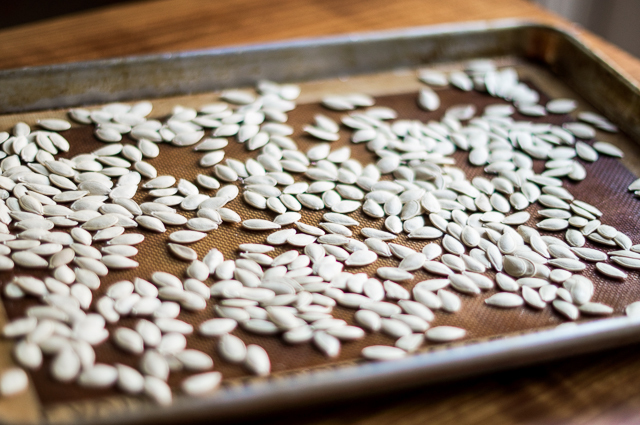 Transfer the seeds to the prepared baking sheet. Drizzle with the oil, rubbing the seeds between your palms to lightly and evenly coat them. Spread out the seeds as much as possible in a single layer. (No need to be compulsive. They get easier to spread out as they bake and dry.) Mix together your preferred seasonings, then sprinkle them over the seeds from about a foot above the sheet for even delivery. Bake, shaking the pan now and then, until the seeds are light brown, 20 to 40 minutes, depending on the size of the seeds. Check frequently near the end as they can quickly go from burnished to burnt. Store leftover seeds, completely cooled, in a tightly covered glass jar or other airtight container. Mmm…one of my favorite fall snacks…can’t wait to try this recipe! Thanks, Perry. The season is upon us! Hi Jennie, I should follow in your footsteps and roast my pumpkin seeds instead of tossing them away. You are a better person than I. 🙂 btw seems like we missed each other at IFBC? Are you going next year? Doubt I am a better person, but I do think it’s worth using as much of our food as is healthful and enjoyable! And I do enjoy pumpkin seeds. 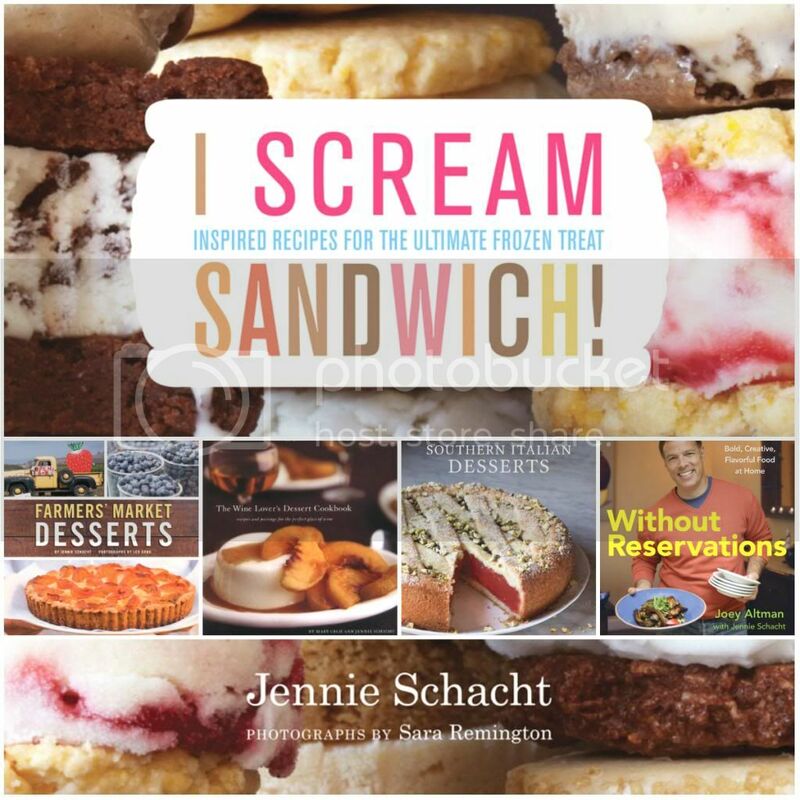 I will indeed be back at IFBC next year and we must make sure to connect there. I saw you once or twice but always deep in conversation. We’ll do better next time! I just found my way here from Speaking of Marriage, and I’m glad I did! I am always on the lookout for new recipes. I will try cooking pumpkin seeds this way. With Halloween on the way, we’ll be having lots of seeds to cook, very soon! 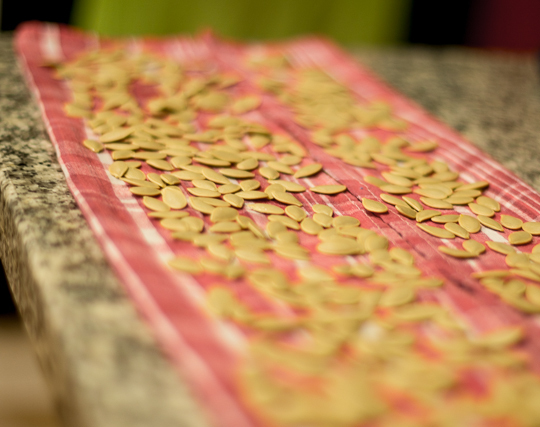 I also like to cook squash seeds. They’re smaller and there are fewer of them, but they do make a good snack for my 6-year-old. Hi Bethany — thanks for stopping by. Winifred Reilly’s Speaking of Marriage has some great information and advice! I was wondering about other squash seeds, thanks for the tip. Winter squash is one of the best things about winter–I’ll give it a try. 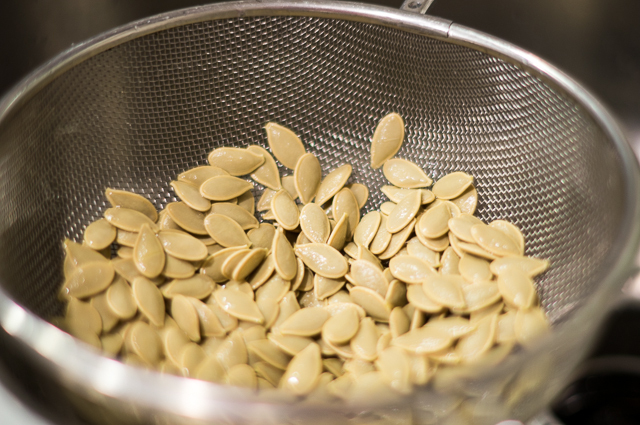 The seeds from regular carving pumpkins can be tough but try this method and see if it improves things for you. I’m guessing they’ll take a bit longer. Enjoy!